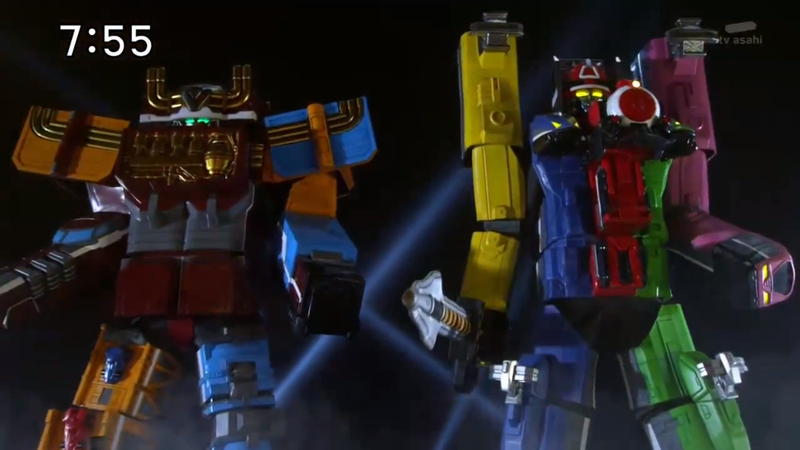 Ten episodes in, and things for Ressha Sentai ToQger are starting to feel stagnant. Nothing really significant has occurred so far, other than new Support Ressha acquisitions (extra zords, for those unfamiliar) and some character development. The plot has remained more or less stationary since the start of the series. Despite this, I’ve been enjoying this sentai series a lot. Episode eight starts off with Conductor and Ticket explaining to the ToQger team that they’ve tracked down another Support Ressha, known as the Diesel Ressha. However, finding and acquiring this one will be a bit more challenging since it’s the oldest of the Resshas and it is separated from the Rainbow Line. According to Conductor and Ticket, when a Ressha is no longer part of the Rainbow Line, it is deactivated, and it may not be possible to reactivate and utilize in battles. However, that is a chance they must take, given the mighty power Diesel Ressha holds. This means that the ToQgers must try to restore it to the Rainbow Line, all the while dealing with a new monster from the Shadow Line, which has placed a bomb on Tokatti and damaged the Rainbow Ressha brakes. Luckily, Right manages to activate the Diesel Ressha and rushes to the aid of his team. Following the last battle, Conductor and Ticket shut down the Rainbow Ressha for repairs and send the ToQgers ahead on the Diesel Ressha. The team arrives to attend a Spring Festival, during which Shadow Creeps arrive and attack. The ToQgers spring into action against them—except for Mio, who is rescued by an unknown man. After the battle, Mio realizes she is infatuated with her mystery savior, who dropped his wallet during the fight. She uses the information in the wallet to contact him for a “rematch.” The two meet later that day, but unknown to Mio, her savior is infected by a new Shadow Monster that controls men, forcing them to seduce girls and then reject them in order to draw dark emotional energy. Mio presents her savior with a lunch box, but he dumps it and destroys the food. However, the Shadow Monster’s plan is foiled when Mio doesn’t get upset, instead confronting and defeating the monster, which grows to epic proportions. The ToQgers are able to form a new mecha from Diesel Ressha and the other Support Resshas, known as Diesel-Oh, and they destroy the Shadow Monster once and for all. Before touching on episode ten, I need to get something off my chest concerning episode nine, because this episode just flat-out bugged me. To put it simply, Mio is totally out of character. She isn’t the type to fall in love with a guy at first sight, and honestly, this plotline is a bad attempt at expanding her character. She is more herself in the second half, at least, when she doesn’t break down after being rejected. I’m really glad she doesn’t join the masses of other girls around the city in that reaction, but the overall situation is still out of character. However, while this episode bugged me, I am also extremely excited by the appearance of Diesel-Oh. In my opinion, this mecha is way more badass then ToQ-Oh. Moving on, episode ten is full of filler focusing on Tokatti. Honestly, nothing really happens worth mentioning. Tokatti is jogging to the next station to stay in shape, while his teammates ride the repaired Rainbow Ressha. During a battle with a new Shadow Monster that has the ability to give titles—titles that come true—to people, Tokatti is sentenced to death. Using some clever tactics, he manages to defeat the title and stay alive, and the ToQgers defeat the monster using ToQ-Oh and Disel-Oh to double-team him. At this point in the series, I am starting to get a little restless. I would really like to see some plot developments, and to cut out the filler episodes we’ve seen in the last few weeks. I enjoy the character development (minus episode nine), but it is time for something to shake the show out of its formula of character-building and finding new Support Ressha. I’m told there are some major developments coming in episode eleven, though, so I can only hope things will improve!